Rick Astley to play at Glastonbury? 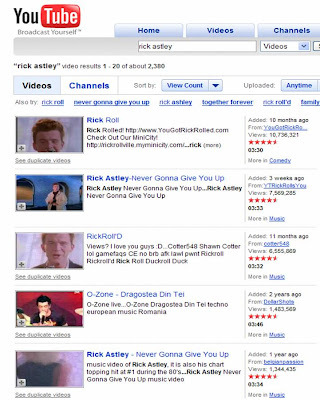 Rickrolling goes to a new level! There is a new online petition at http://www.rickandroll.com that aims to get Rick Astley onto the bill for Glastonbury 2008. "What better way to celebrate a mad few months and a seemingly poor Glastonbury line up than to try and get the very man himself to perform at the world famous Glastonbury festival this summer?" This has not come out of the blue though. Rick Astley has received massive internet coverage recently and 80's classic 'Never Gonna Give You Up' has come back in a big way, with the song even entering Amazon.com's top 100 downloads recently. 'Rickrolling' has now developed beyond just redirecting unsuspecting users to the 'Never Gonna Give You Up' YouTube video. 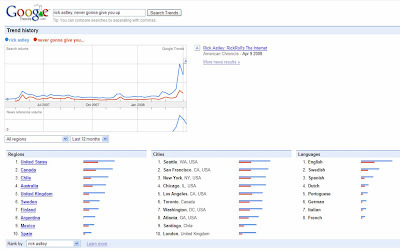 The loud playing of, or singing of, 'Never Gonna Give You Up' has also been used in public places to cause disruption. Scientology churches have been repeatedly 'serenaded' with the song, College basketball games have been hijacked and the New York Mets were forced to play 'Never Gonna Give You Up' for their 8th innings recently after a Rick Astley won their online poll by a landslide! If this activity, and the subsequent online petition, gets Rick Astley onto the line-up at Glastonbury then it will be another great example of how viral internet activity can develop into something much larger - an online prank becoming culturally significant!